Our work here is done!!! It's just before 5pm on Friday and we have wrapped up our brief contribution to the building project here in Csurgo in Hungary. It has been a wonderful 10 days and we are deeply proud of the work we have done in this short period of time. It takes 10,000 man-hours to complete a house and together we contributed about 1000 hours, nearly 10% of the total time. The experience has been life changing. The sense of team work, co-operation and mutual respect amongst the team and the community in Csurgo has been a powerful emotive outcome to our brief stay. The people have been so friendly, the hotel staff exemplary, Peter's hard work and vision has been an inspiration to us all and we will all leave with a deep sense of sadness but I hope pride as well. 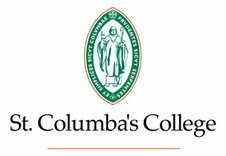 The pupils of St. Columba's College have been a shining example of industriousness and duty. They have made the teachers' role as team leaders an easy one. They should be commended for their excellent behaviour and hard work on site! Today, on site, we completed the final coat of primer on the outside walls, sealed the woodwork in the interior of the houses and tidied up the site! We also got an opportunity to visit two families in neighbouring Habitat Houses to see what a completed house would look like. The first thing that struck me was the quality of the finished product. The houses were warm and cosy and extremely comfortable. Considering each house costs just over €30,000 it is amazing to see such a high quality product emerge. The families contribute just over €100 per month to pay off their interest free mortgage on their home. The pride each family has in their home is admirable and inspiring. 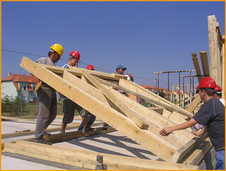 The Habitat for Humanity principles and philosophies are expressed here to the fullest. But none of this would be possible without SUPERMAN himself, Peter Geszti. He single handedly runs the work site and co-ordinates the teams (including their R&R). He is a one man Habitat machine. So another year down and another Habitat experience over. It has been an excellent trip for all concerned, despite sickness and ill-health, and I hope this is not the end of St. Columba's connection with Habitat Hungary and the wonderful people of Csurgo. Although, I'm not sure we will be allowed back for St. Patrick's Day again!!!! Only kidding! Humphrey Jones, Paul Cron, John Fanagan, Frances Heffernan, Peter Watts , Laura Hanna and all the pupils! The house as we leave it! Laura and Lauren tidying inside the houses. Hope you're all enjoying the rest of your Easter holidays.